I’m on a bit of a snood making frenzy at the moment. I’ve decided they’re one of the best things I can use to keep my hair out of my face, that won’t end in a headache. Here is one I whipped up over the weekend. Made with Spotlight’s Yarn Bee Bamboo ribbon yarn in “Blue Java” colourway. It’s light, drapey and very comfortable. Using a worsted weight yarn (or a tape/chain yarn), 6mm needles and a 5mm crochet hook. Bind off using crochet bind off. Continuing with the crochet, add a round of single crochet around the entire piece, being careful not to draw it in too much (I did 2 sc’s per knit row around the top, and 1 around the base). Joining with a slip stitch, cut yarn and weave in. Figure out the points that will end just behind the tops of your ears and mark on both sides. With the right side out, work fanfare stitch row starting at one mark, then working over the top of the piece to the other mark. Continuing on, holding some hat elastic, work single crochet around base catching the elastic within the stitch around base to the first mark. Then work second row of fanfare stitch back around top of snood. Cut yarn and weave in end. Adjust elastic as needed and tie off both ends. Little things for this Year. Do you have a pattern for a snood that uses wool instead of ribbon. You can use this pattern with plain yarn as well. I’m about to do one, actually, for winter. You would need to use a DK (8ply) or Worsted/Aran (10ply) weight, though. What does Pbf mean in the pattern? 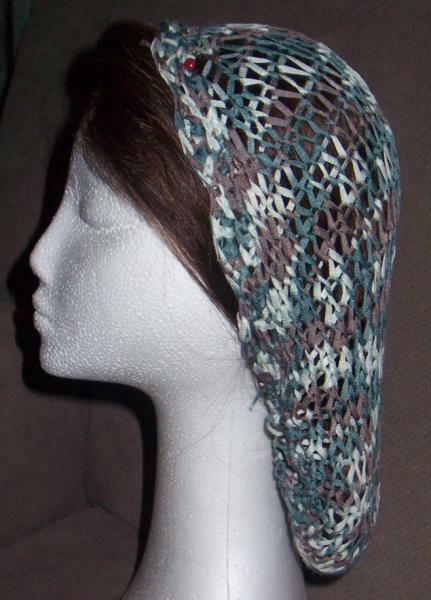 Thank You for sharinf this pattern , I have been looking for a snood pattern for a whlie now , I too get headaches from other hair accessories . What do you mean? Are you trying to say to add a stitch, like YO (yarn over) or something else??? If you mean something else, could you please explain? I’m confused on that part! Also, on the purl row where you increase each end, is it just the end, or do you mean both ends, as in the first and last stitch of that row? Also, when you begin decreasing stitches, do you knit the knit rows as you said to in the beginning or just normally? I’m trying to find a nice snood pattern that doesn’t show any of the hair (as in no huge holes/net look) that also doesn’t require crochet (I don’t know how! )…any ideas? That’s a tough one. You could, essentially knit a big oval shape and gather it up around the edge, but it wont have the same drape.